Hi, I plan on being arrested by the Muscular Dystrophy Association at 1 p.m. on April 1, 2010. No fooling – they’re coming to get me at Pathways Church and take me away to Spring Creek Barbeque in Grapevine, TX where my bail is $1,480.00 and you can help bail me out ahead of time by going to my donation page for the Grapevine Area Lock-up by clicking here. $1, 480 might seem like a lot of money, but here’s what it buys: 20 minutes of MDA research. 20 minutes. Twenty minutes was about the length of this visit, one of Andy’s first with his Godson, my son Zack, who is now 13. 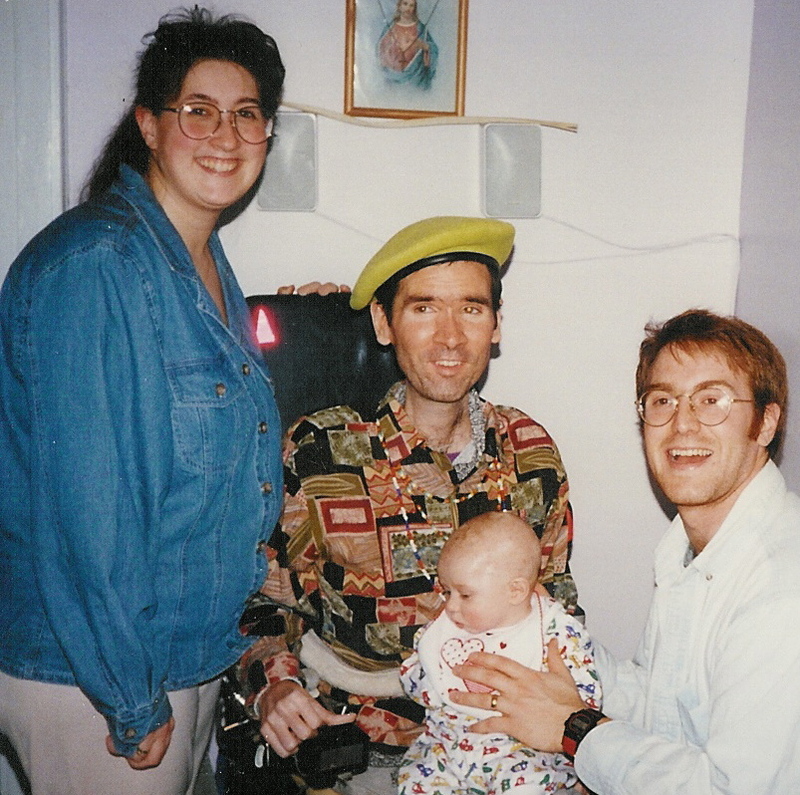 My best friend, Andy Maxfield, died just after Christmas in 2004 from complications related to Muscular Dystrophy. You can read about Andy in the last of a July 2007 sermon series I did on friendship, “When You Paint a Purple Sky.” Andy was a minor celebrity in our small Massachusetts city as was always out and about in his chair in good weather until his health deteriorated too much near the age of 40. 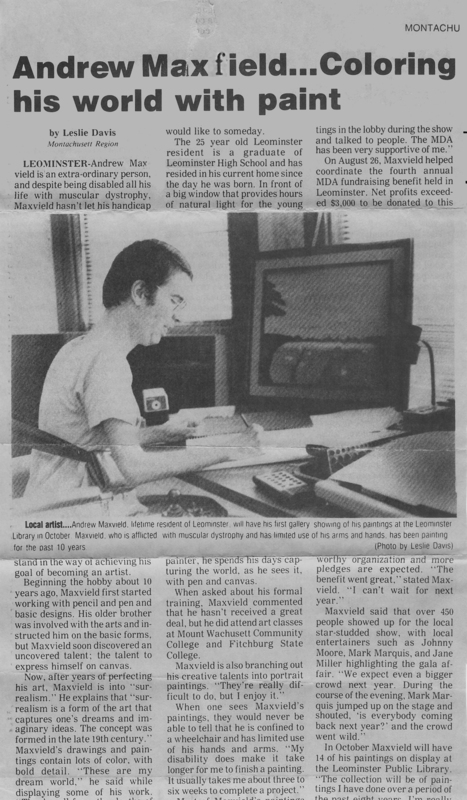 He was in the news quite a bit for as both a fund raiser for MDA and for his work as an artist. When Andy died the local papers covered his passing and published reflections by his brother (part1, part2), spurring one woman, the mother of another young man with Muscular Dystrophy to write a Letter to the Editor in appreciation for sharing Andy’s story. I could tell you all about the 6 clinics MDA funds here in the Dallas-Fort Worth Metroplex, how an initial MDA diagnostic work up costs $300, or how it costs almost a $1,ooo to pay for one week of MDA summer camp for one child, but I’d be kidding you and lying to myself if I told you that for me, this was about something besides Andy first. He was my best friend, he changed my life, and Muscular Dystrophy took his. If you’re reading this and you’re able to make a donation, please go to my donation page and give. One of the last things Andy said to me was to not take my life and health for granted. I’m trying my best to follow his last request. You can see some of Andy’s original artwork from throughout his career at my flickr photostream. Next Post Reading is Believing?